That fat squirrel is adorable! 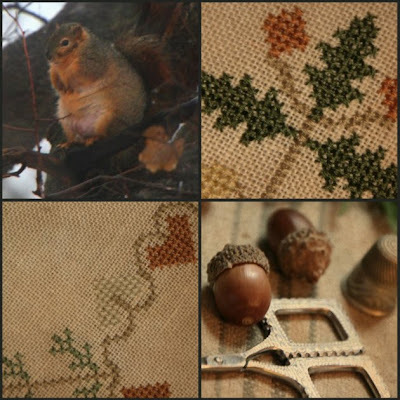 I also love what you said about the red squirrels - "they collect way more food than they can ever possibly eat"....it reminds me of those of us who collect way more cross stitch charts than we can ever possibly stitch! LOL I am definitely guilty of that. I am planning on starting a new project on New Year's Day. It is down to 2 patterns and one is "Snow Day". Even though it doesn't snow in my town, it snows in the mountains not too far from my house and the mountains are full of snow right now. Also, we are having colder weather than usual here in So California (in the 30's at night) so Snow Day seems appropriate. Beautiful photos Brenda. Love the fat little squirrel. Hello Brendy, every picture you make makes me smile.It gives me just like a lot of others a great inspiration. I love looking at your photo's, I feel like I'm looking at pages in a magazine. Happy New Year!